The Flintstones is an animated American television sitcom that ran from September 30, 1960 to April 1, 1966 on ABC. Produced by Hanna-Barbera Productions, The Flintstones is about a working class Stone Age man's life with his family and his next door neighbor and best friend. The main character, Fred is an accident-prone quarry worker and head of the Flintstone clan. He is quick to anger (usually over inconsequential matters), but a very loving husband and father. 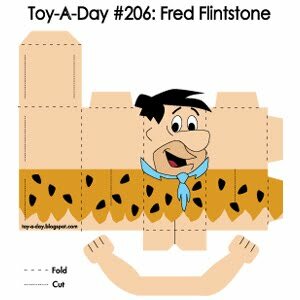 Download the PDF file here and make your own Flintstone toy!